While living on the Toronto Islands, I share a stained glass studio at Gibralter Centre for the Arts at Hanlan’s Point. To give myself the pleasure of working in the studio alone, I often work at night and head there on my bike at dusk, touring the full length of the boardwalk along the southern edge of several of these islands, to get to the Arts Centre. A small barn owl becomes my regular companion visible only in flashes as she veers skillfully through the trees and disappears into the woods on my arrival. After a long nights work, withdrawing myself from the intensity of my creativity, I drive home through the deep night along the boardwalk, to return to my tiny cabin on Algonquin Island. Again the owl joins me swooping just beside me, this time over the water, so close the sound of the wind in her wings vibrates in my ears. One night I look over my shoulder to see a bright pink moon rising over the peninsula in the bay framed between the owl’s wings, glowing in the moonlight, with the quiet waters below shimmering in reflected light. 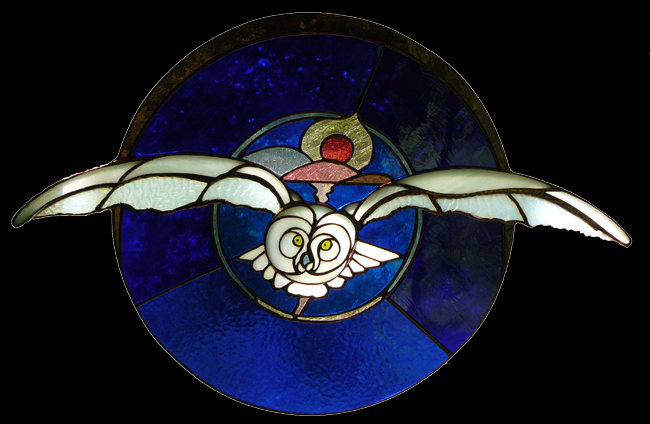 I rendered “the Owl and the Moon” to honour that moment and my relationship with this owl, my muse, my guide.